It’s been a whirlwind of odd jobs and touch ups for everyone over the past ten days. I’ve been painting skirting boards, no-more-gapping round windows, sanding soffits, patching up dents in walls and landscaping. 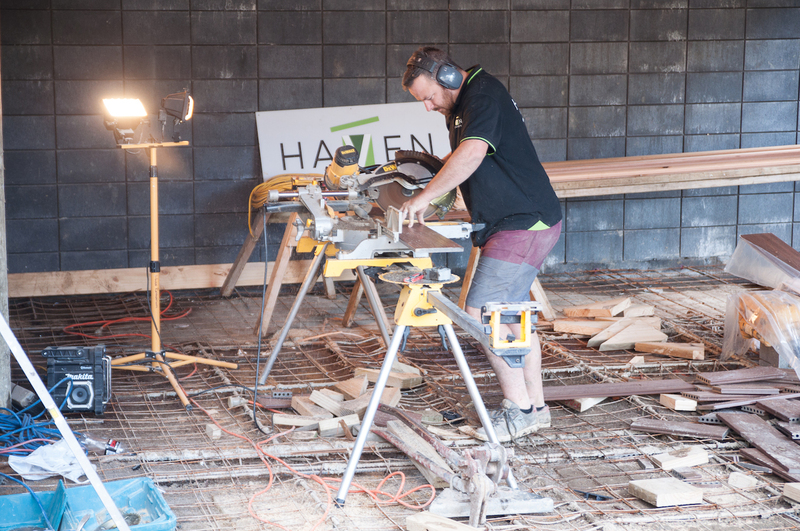 Meanwhile Garrick and the boys from Haven Renovations ticked jobs off their to-do lists like men possessed. 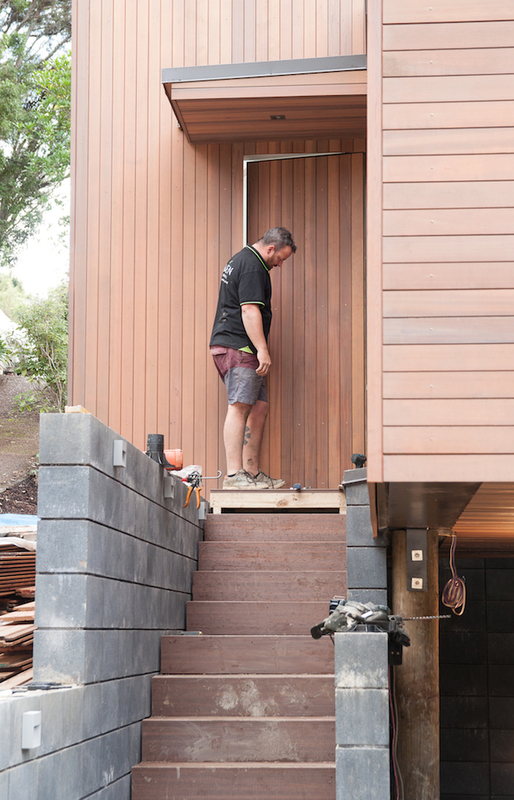 Two of the most exciting things they finished were our entry stairs and front door. 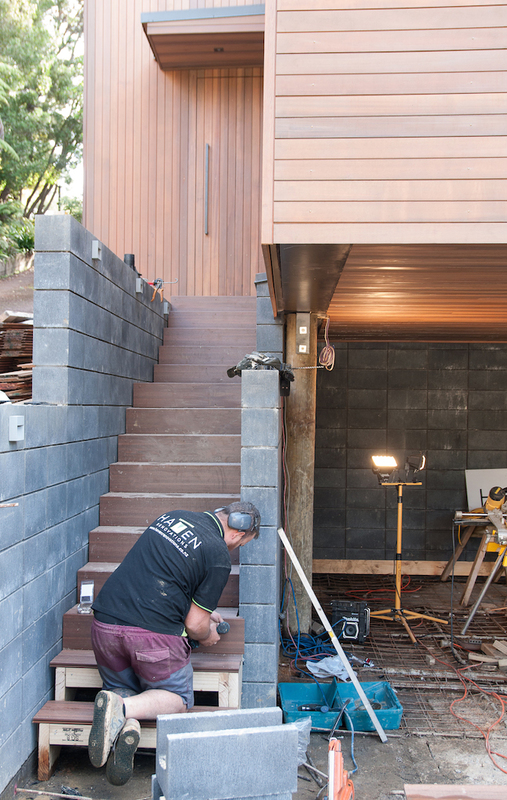 Up until now the access into the house has been via a makeshift ramp up onto the deck behind the living pod. Since we began building I’ve had this idea of a hidden front door and it’s a feature I’ve been determined to see come to fruition. I thought it would be easy enough to achieve. 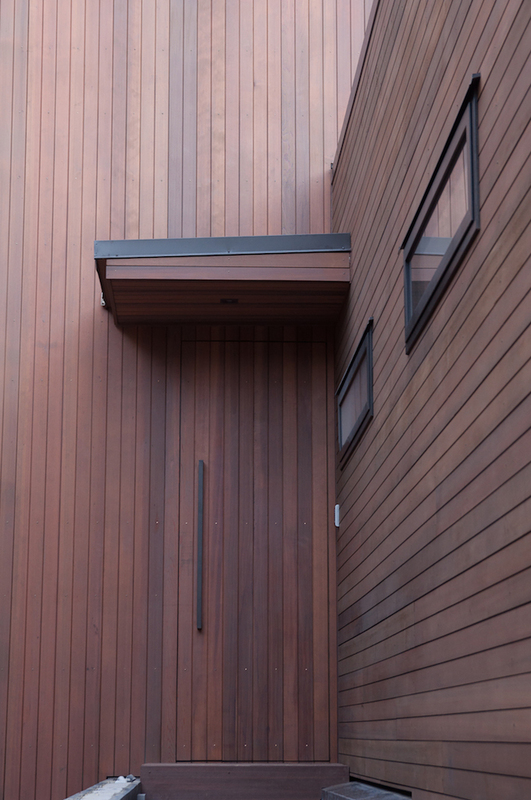 Just run the vertical cladding on the building down over the door too, but of course it’s far more complicated than that. However once again even this tricky brief was no match for Garrick as he nailed it with his typical excellence. It looks incredible, with only a subtle door handle providing any clues as to where the front door is. 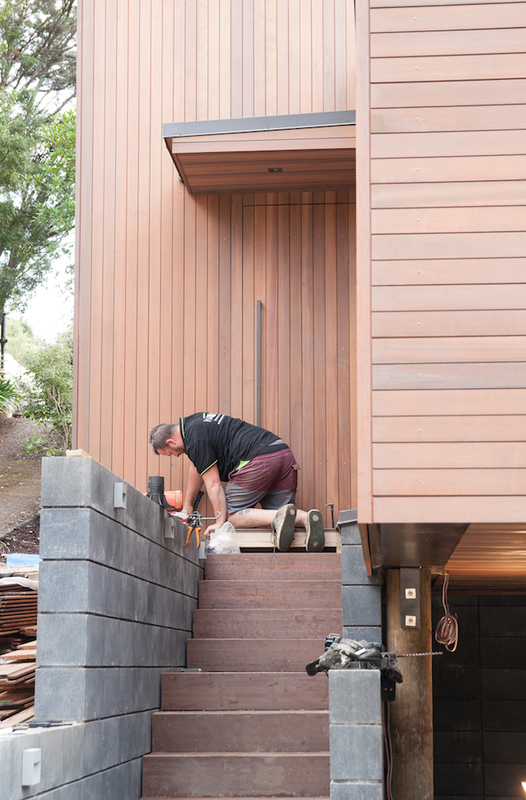 That and the fact we now have stairs leading up to the door, fashioned from Outdure’s composite timber that we’ve used on our decks. So for the first time we’ve been able to enter the house and walk through the spaces exactly the way we designed them, which has been really refreshing. 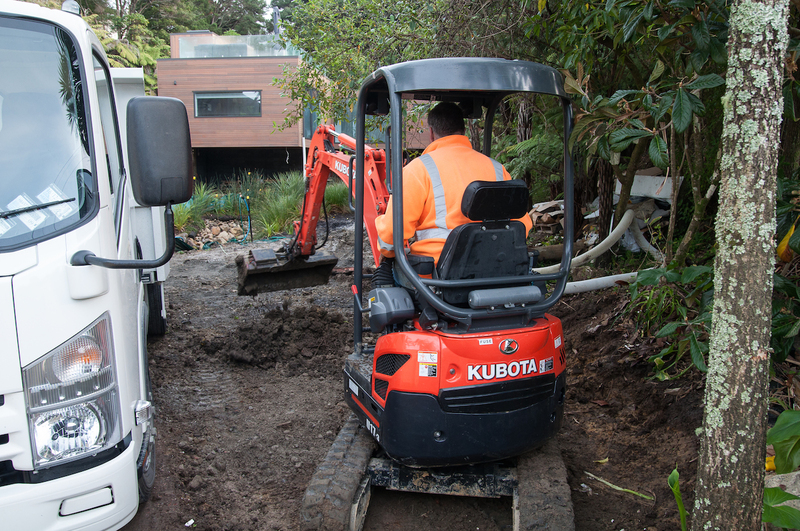 Carrying on with the outdoor activities, our driveway and additional parking bay was prepped mid-week by our earthworks contractors. They dug the areas back to their correct levels and took away the excess soil before filling them back up with metal. It weird how much a bit of gravel was able to transform these areas, but for months we’ve been staring at stagnant pools of water and tracts of goopy mud. Now that’s been replaced with hard fill that we can actually walk on and park on. It looks great already, so we can’t imagine how amazing it will be when Firth and the layers come in next week to actually pour the concrete and finish the entrance completely. 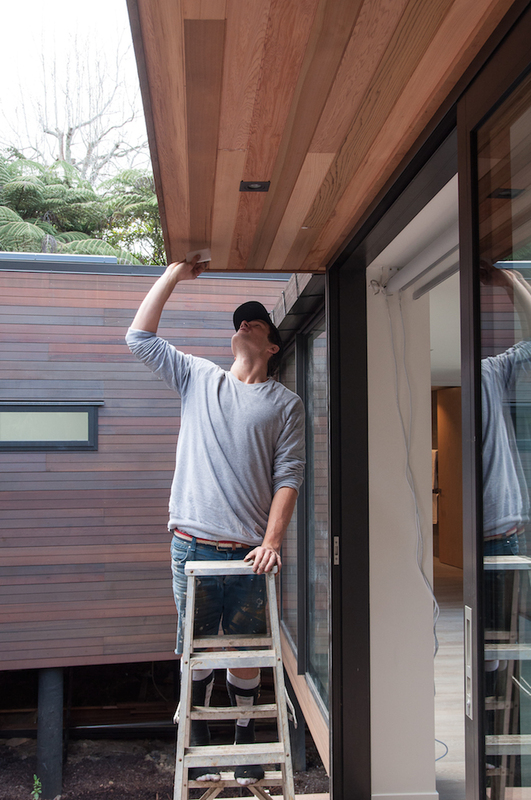 Sanding the soffit behind the living pod. Our hidden front door. How good that look!? 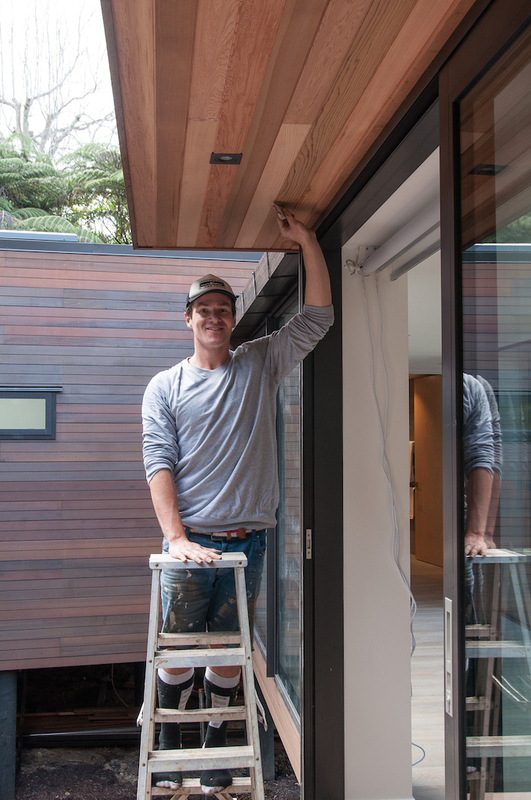 Garrick putting the finishing touches on the front steps. Prepping the parking areas before the concrete is poured.